Bodybuilding (training for size) and strength training (training for strength, irrespective of size) may seem to be completely different outcomes, but not everything is as black and white as it seems. The main differences in outcomes is that the typical bodybuilder will not have the explosive strength and speed of someone training for strength, but the strength devotee will tend not to have the same muscular development of a bodybuilder. Although bodybuilding practices may have limited use in strength training, there is some useful crossover of strength training practices when it comes to training for size. In this article it’s all about seeing how strength training practices can be used to not only build more muscle, but build better muscle tone. In the body there are numerous different types of muscle fibers. The most abundant are the slow twitch, mid-long endurance type fibers. In the minority are the fast twitch, explosive fibers. The endurance type fibers are built by training using higher repetitions – such as in bodybuilding when repetitions of 7 – 15 are routine. Of course, with higher repetitions, less weight can be used. Whereas, for explosive strength, low repetitions of 6 – 1 are performed and the amount of weight used should be heavier, and be maximal to allow you to complete a set, but not easily. This first builds neural strength – which is a better motor response from the muscle, before the muscle fibers themselves enlarge to cope with the continuing demand. 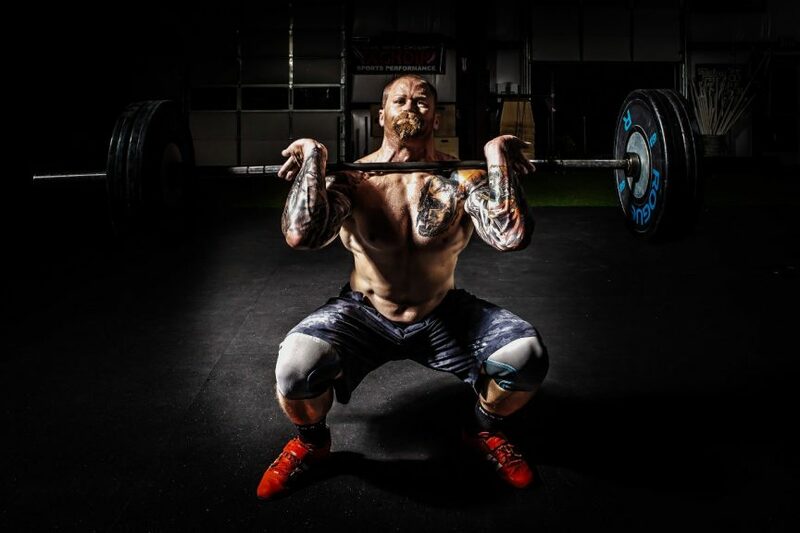 Low repetitions – such as those in strength training, are the only way to build the fast twitch fibers, so when you are trying to build overall muscle size such as in bodybuilding, you need to build up these muscle fibers too if you are to have maximum size development – and also – be strong with it. As for muscle tone, this is a rather grey topic. Some believe muscle tone is something achieved by making the muscles tense and tight even when relaxed, a concept rife in popular fitness magazines. I don’t buy this. I do believe muscles develop more nervous response the more advanced a trainee becomes, therefore can contract harder (better neural response), but the idea of muscle tone to me is nothing more than an absence of body fat – giving the appearance of being hard bodied. Which, of course, anyone can have, if only we had low enough body fat. Strength training (low reps heavy weight) again, is key to losing fat, and is much more effective than using lighter weights for higher reps. This is why strength training practices are nothing but a plus for those pursuing a better, bigger body. If you are into bodybuilding, then the chances are you’ve never used rep ranges of 1-4, and for all intents and purposes, for sheer size, they would be almost worthless to you. Rep ranges of 1-4 may add a modicum of size (after a long period of using them), but really, they are for pure strength training. Some may say, extreme strength training. The thing about extreme strength training is, it’s short lived. You give out a maximal effort, and within a few short reps your muscles give out. It has very little use in the way of practical strength which may be useful for sport or whatever. If you continue training with 1-4 reps, you’ll only get better at 1-4 reps, and it will have very little carryover to other rep ranges. And the same holds true for higher reps, they will have very little influence on how much you can lift in lower rep ranges. Low reps work for strength because we have different types of muscle fibers – a whole range of them actually, ranging from very slow twitch to very fast twitch. Very slow twitch fibers (which make up the vast bulk of our muscles) handle the tasks of endurance, while the small amounts of very fast twitch handle the explosive lifts. When we perform endurance tasks, we are recruiting and using the abundant amounts of endurance (slow twitch) muscles we have. When we switch our training to explosive training (which is definitely what 1-4 reps is) then we are in need of muscle fibers capable of providing short-lived, but explosive power. This is why those who train for strength always use reps of 6 and less, all the way down to 1. That way, the repetitions cover the whole range of explosive fibers. The body is made up of different types of muscle fiber. It has a spectrum ranging from very slow twitch to very fast twitch. It’s true that, higher reps tend to be the best for overall muscle size because the average person’s muscles are made up of a majority percentage of slower twitch muscle fibers. It makes sense doesn’t it? As our maximal lifts improve, our previous maximums allow for more endurance. What we benched for one rep 2 years ago we can maybe now do for 10, etc. As our lifts progress we begin recruiting and strengthening even higher echelon twitch fibers. That is why we have a much lower percentage of fast twitch fibers. The force generated is far beyond the slow twitch, but it doesn’t last anywhere near as long simply because our day to day lives aren’t all about maximal effort, muscle wise. Right – now to the point I’m going to make about low rep training. When training with low reps and heavy weight, what you are doing is, you are training your faster twitch muscle fibers so they can grow. The benefit here is, you are training the percentage of fibres which most bodybuilders neglect completely. And, it could equate to a sizeable percentage of muscle size, not to mention the far greater amount of explosive power you are going to gain from it. The best way to do this is simply to start with a 1 rep max, then a 2 rep max, 3 rep max, and so forth – up until 4 rep maxes.